Review posted September 10, 2014. Arthur A. Levine Books (Scholastic), 2014. 226 pages. 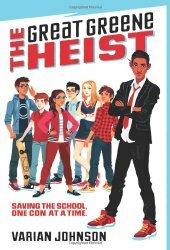 This is a Heist Novel set in middle school, and it’s tightly plotted and brilliantly executed. On top of that we’ve got a diverse cast of characters, nicely reflecting middle school students today. In the tradition of heist stories, the caper is pulled off by a team working together. The heist in this case is to steal the student council election. But don’t worry – it’s ethical because the principal has accepted a bribe to make Keith Sinclair win. Keith would have the power to cut funding for all the student clubs he doesn’t like – and he doesn’t like any that Jackson Greene is involved in. The book starts, expertly, in the middle of the action. Jackson already has a history of schemes and cons. After getting caught on “The Kelsey Job,” otherwise known as “The Mid-Day PDA,” he is not allowed to carry a cell phone, and has promised to reform. And his friend, Gaby, hates him. Because Jackson was caught in the principal’s office, kissing another girl. Gaby de la Cruz is the one running against Keith Sinclair, and she’s the one who should win. However, as it becomes clear that Keith is going to use shady means to win, Jackson reluctantly agrees to bring his formidable talents to bear on making sure Gaby gets elected. The characters in this novel are varied and realistic middle school students. The election is taking place the same day as the end of year formal, so there’s added tension as to who’s attending the formal with whom. I love the way Jackson is brilliant in planning a job – yet as clueless as any thirteen-year-old boy about girls. The action keeps moving, so you never want to put down the book.